One of my favorite local haunts over the last several years has been the Morbid Anatomy Museum. It’s no surprise that any establishment with a logo that features an owl sitting atop a skull would get my attention. I collect both. Though its physical incarnation in lower Brooklyn is sadly in repose MAM is not just a tangible space but a malleable idea. 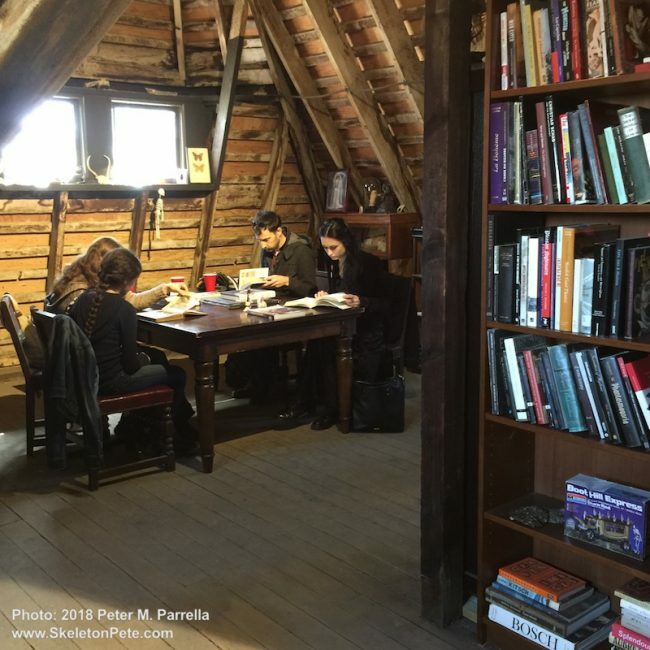 Begun as a blog, project initiators Joanna Ebenstein (Director) and Laetitia Barbier (Programming Director and Head Librarian) have found several ways to keep the community connected. Their latest version opened this weekend as a collaboration with Brooklyn’s historic Green-Wood Cemetery in the form of a multi-week residency. 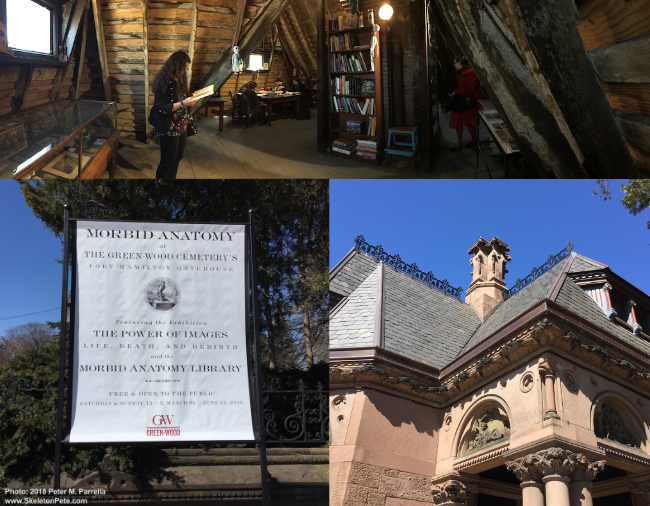 The library, along with an exhibition titled “The Power of Images: Life, Death, and Rebirth,” is housed in the Cemetery’s Victorian Gatehouse located on Fort Hamilton Parkway near MacDonald Avenue. The 1877 structure is a city landmark designed by Richard Upjohn, and is just one of the architectural and landscaping designs that make Green-Wood’s 478 acres a must see. 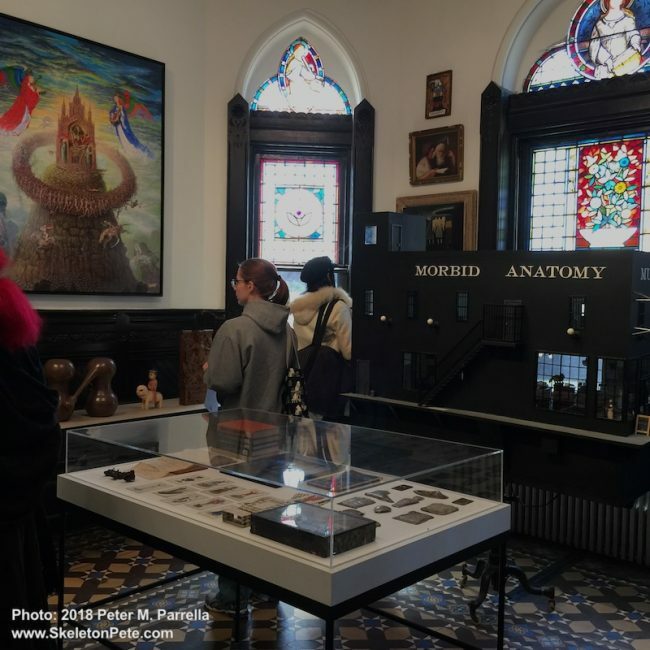 Artifacts from the Green-Wood Historic Fund are intermingled with loan pieces from the personal collections of Morbid Anatomy collaborators and contributors. An astounding memento of the museum’s former 7th Street home greets ground floor visitors. It’s a perfect miniature rendering of the building exterior and interior by artist/filmmaker Joel Schlemowitz. From the elephant skull and religious statues at the entrance to the Bauhaus LP in the Black Gold record bin and anatomical Venus figures on the second floor, the replica is pinpoint accurate. That is aside from the anthropomorphic mice serving as miniature staff members. The Gatehouse second floor offers the library of over 1,000 tomes a unique home. Curious browsers can relax beneath the open rafter work of the building’s gothic revival peak. It’s a perfect setting for the collection of arcana and could have easily served as a set for one of Roger Corman’s 1960’s Edgar Allan Poe films. It was wonderful to see the materials being put to proper use again. 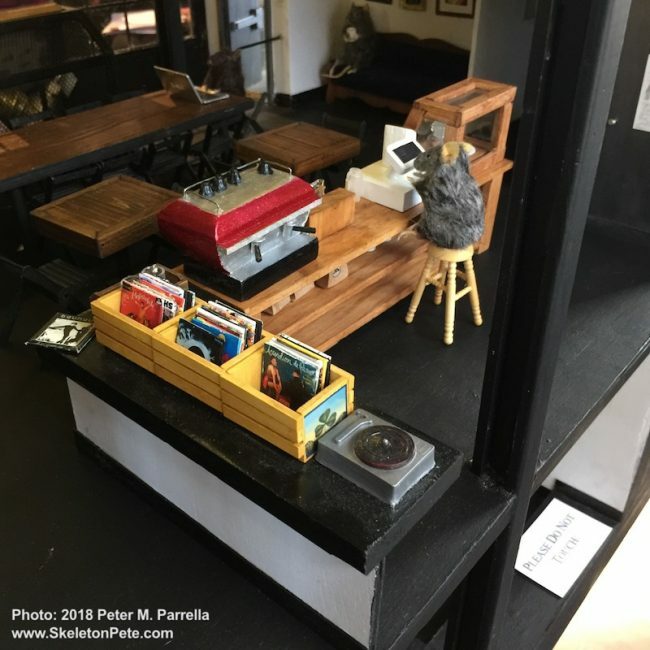 Mice are nice: A perfect miniature replica of Morbid Anatomy’s former museum space is a must see. It seems quite appropriate that during Passover and Easter – celebrations of rescue and revival – we should see the return of a resource that promotes scholarship of the convergence of ritual and science and slim line between metaphysics and medicine. The residency is open on weekends from 12 Noon – 5 PM through June 24. I’m looking forward to attending several of the lectures later in the season. For more information on specific dates and to purchase lecture tickets please visit the Green-Wood Cemetery Events Calendar. Aficionados of the macabre would do well to procure a copy of museum director Ebenstein’s recent book Death: A Graveside Companion which is brimming with memento mori images and essays . Opening day visitors peruse the art and artifacts at the “Power of Images: Life, Death and Rebirth” exhibit. You must be very excited about the return of this entity – I look forward to your musings about the visiting there during this time. Enjoy.